We, Steadfast Neuro Rehab & Clinical Services, situated at VV Puram, Bangalore, Karnataka have pioneered the concept of complete quality neurological care under a single roof with the assistance of our neurologists. We’ve had an inspirational journey of delivering efficient care to patients with the help of a dedicated and proficient team of professionals. Patient satisfaction has always been in our DNA. Healthcare is simplified like never before with our rich knowledge and experience, be assured of quality health service. 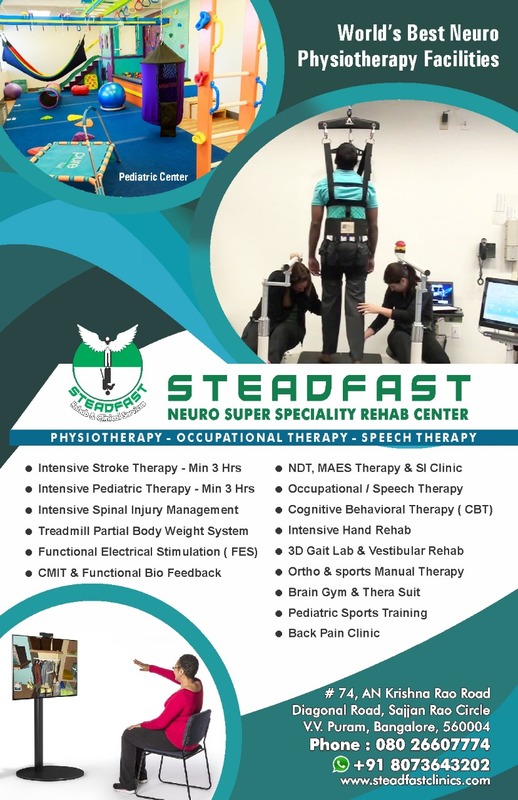 Steadfast Neuro Super Speciality Rehab Centre provides a neurological physiotherapy service throughout Greater Manchester and Cheshire. Our specialist neurological physiotherapists have experience treating adults and children with a wide range of neurological conditions. We commonly see individuals who have been discharged from the hospitals with “no rehab potential” or those who have reached a “plateau” go on to make significant improvements. Steadfast Neuro Super Speciality Rehab Centre optimise the quality of life their patients by promoting their physical ability. Small Movements Make a Big Difference. As children and adults begin to move more independently and learn about their environment and the world around them, they see things of interest and their curiosity is awakened. Provide clear and accurate information regarding our services. Deal with all enquiries in a prompt, considerate and knowledgeable way. Provide services that are appropriate and in line with our patients needs. Deliver the same standard of service to every patient, irrespective of their gender, age, race, religion or physical ability. Offer a range of services to ensure we can strive to arrange an appointment time and location that best suits your needs. Aim to deliver an efficient, seamless and pleasant service. Ensure each patient contact will reach an appropriate conclusion, and strive to reflect patients individual lifestyles, ambitions and personal goals. Provide a safe, private and friendly environment. Support a patients right to decline any treatment option without prejudice. Provide our staff with the right equipment and education to deliver a high standard of service. Enable patients to provide feedback easily, and use this feedback to shape our practice. Respond to complaints within 5 days. Ensure that if we cannot help you, we try to find someone who can. Steadfast make the following promises to achieve shared aspirations. We promise to put patients first in everything we do. We put each patient’s needs at the centre of all decisions and everything we do will be done all in the best interest of the patient. We accept that some people need more help, and that not all goals will be realised, however, we strive to achieve the best possible results for each of our patients in all circumstances. We promise to earn the trust placed in us by insisting on quality and striving to get the basics right every time: safety, confidentiality, good communication, professionalism and, dependable service. We welcome feedback, learn from our mistakes and build on our successes. We promise to respond with kindness to each persons needs, anxieties, pain, and desires. We search for the things we can do, however small, to increase each person’s quality of life. We do not wait to be asked, because we care. 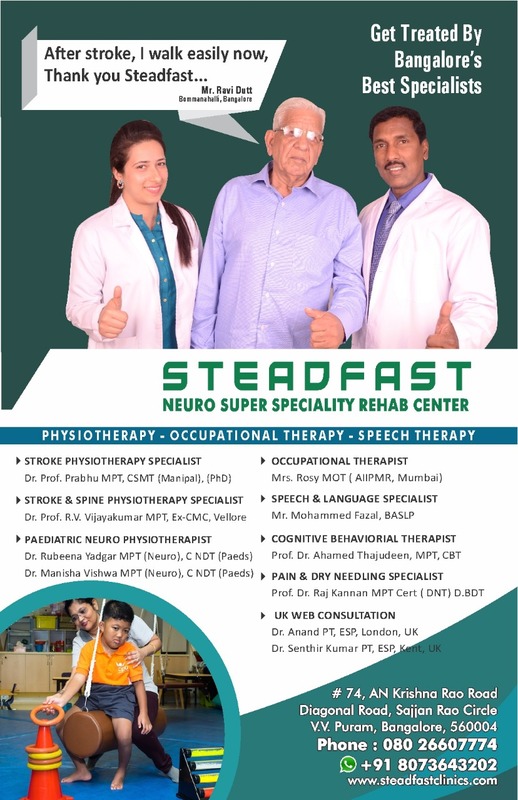 At Steadfast Neuro Super Speciality Rehab Centre, we are dedicated to making a difference in the lives of all the patients we come into contact with. Maximise patient satisfaction throughout the therapy experience. Promote an environment where all patients can develop and excel beyond their expectations. Ensure that all patients are aware at all times what treatment is available to them, and to help patients access any services that may be available. Operate only within the highest standards of regulatory compliance and integrity, not only to meet the requirements of our professions, but because of our beliefs. Be leaders and innovators in evidence-based neurological rehabilitation. Design highly effective treatment programs that are customised to the individual needs of our patients. Continue to explore and develop new techniques, products and treatments that meet the needs of our patients. Limit the impact of degenerative and life-limiting illnesses by helping all patients maintain a better quality of health. Empower our patients to achieve their goals, whilst at all times facilitating individual choice. Do your physiotherapists practice the Bobath concept? Do I need a referral from my doctor or consultant? I have arranged an appointment for a relative. Can I come and see what is involved? I had a stroke six months ago. Can I still improve with physiotherapy? Neurological physiotherapy is the treatment of problems caused by disorders of the brain, spinal cord and nerves. These often present as weakness, paralysis, spasticity, walking problems, movement problems, reduced balance and difficulty performing everyday activities. We utilise a combination of numerous physiotherapy principles to provide the most beneficial treatment for our patients. These include the Bobath concept (normal movement), the Carr and Shepherd approach (motor relearning), the Brunnstorm approach and conductive education. The treatment approach used will vary depending on the individual, their symptoms and their goals. This allows us to maximise your potential. Steadfast accept referrals direct from patients, relatives, carers, case managers and solicitors. If you have private medical insurance feel free to telephone or email Steadfast and we will be able to provide advice as different insurers have different referral policies. Following your initial assessment our physiotherapists will be able to give you an idea of the number of treatment sessions you require. The length of treatment will depend on your condition, your symptoms and your rehabilitation goals. There are numerous factors that can have an impact on whether you will be able to walk again in the future. Following your initial assessment your specialist physiotherapist will be able to advise you on realistic rehabilitation goals. 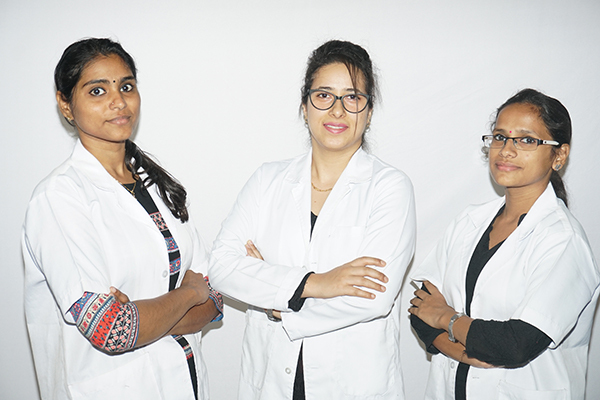 Steadfast Neuro Super Speciality Rehab Centre ensure that we maintain adequate staffing levels to allow all initial assessments to be performed within 48 hours, if required. Subsequent treatment sessions can be arranged at times and intervals that best suit you. Your physiotherapist can advise you and liaise with your GP regarding returning to driving. If required, Steadfast Neuro Super Speciality Rehab Centre can refer you to relevant services and professionals for a driving assessment. Steadfast Neuro Super Speciality Rehab Centre believe that relatives have an important role to play in the rehabilitation of their loved ones. Attending appointments will enable your physiotherapist to provide you with relevant advice to promote the recovery of your relative. We can also teach you suitable exercises that can be performed or practiced, with your relative, at home between appointments. Following a stroke a rapid improvement is often seen over the first few weeks. With the correct physiotherapy input from our specialist physiotherapists improvements are possible over the following years. Following your initial assessment, your physiotherapist will be able to advise you on how much improvement is possible.